Nah, Klefki would be all high-pitched, probably with some irritating "jingle" speech quirk. By the way, when I said "Discussion with...", I meant "Brought up in a discussion with..." Other people can chime in! Speaking of which, Chimecho would be echo-y, constantly singing, and deeply irritating. New discussion! Pokémon who'd be really good at certain sports. Inspired by a discussion on a cricket blog, where an article actually mentioned Pokémon. There's a cricket commentator who constantly talks about "batting with a stick o' rhubarb" (he's from Yarkshire), which made me think about how good Farfetch'd would be at cricket (or indeed baseball) with its leek. Well, obviously this guy's got Judo on point, but that's cheating somewhat. Yarkshire? 'Tha 'ow tha thinks we talk up North, cocker? 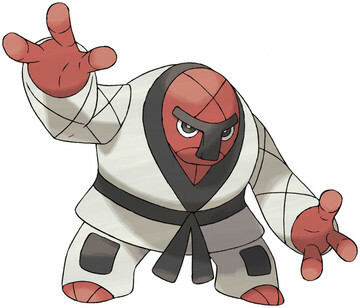 I reckon Hariyama could take 'im. I reckon Floatzel's your best choice for the triathlon. High speed, can swim, can use those tails to power the pedals! Kirlia would be an excellent competitor in the rhythmic gymnastics. I'd go for Meloetta. Do you get extra points for changing form halfway through? How about Dragonair for synchronised swimming? On the date of release of Pokémon Shuffle (which is what we all were doing, awkwardly, when its mechanics were announced (not that kind of shuffle )), what are everyone's favourite Pokémon spin-offs? Hands up, straight away: I've not played many, but I enjoyed Pokémon Ranger and XD probably about the same amount. Never mind spin-offs: Pokémon XD is my favourite Pokégame, for its time, full stop. I'd love to see a follow-up or sequel based in gen. 6 or later, but given how badly the home console games sold compared to the handheld hits, it seems incredibly unlikely. Rule of the story? There's a point where hax ruining your battle stops being rage inducing and starts being extremely hilarious. And yet I still managed to scrape a late match win. Take that tilt hax!! It's very safe to say I would have won that a lot easier had I not been plagued by hax at every turn, from constant paralysis to constant special defence drops on my walls. The tilt is in full force right now. That was a good watch, Athrun - I don't really understand the intricacies of competitive Pokemon, but it was a fun watch nonetheless. Nail-biting finish, too. Glad you enjoyed it Jay, and yeah the finish was pretty nerve-y, I honestly wasn't sure if Snorlax would live a Thunder at that range and I almost left it in and gave up, but I did invest a lot of J.Hockey's ev's in his special defence so I suspected he might be able to barely live without the drops he had. The real problems with the hax was that being paralysed like my cresselia was meant it couldn't have as much health as I would want, it's physically defensive so it actually would have lived a knock off from machamp if it had more health even with the crit. Although it was both being paralysed as much as it was coupled with the critical that really sucked, it either would have lived with the crit because it would have been able to have more health or it would have plain lived because the most machamp's knock off does to my cresselia is 39 percent, unless it's choice banded although if it was choice banded it would have done more to snorlax I believe. If the cress had lived odds are they wouldn't have got much further than the porygon, I've had cresselia completely wall teams when they get too weak. It's actually really good in the uu environment. Yup, that was quite a funny one. Although my favourite part was Tony Abbott the Lucario. Who's the Porygon2 named after? 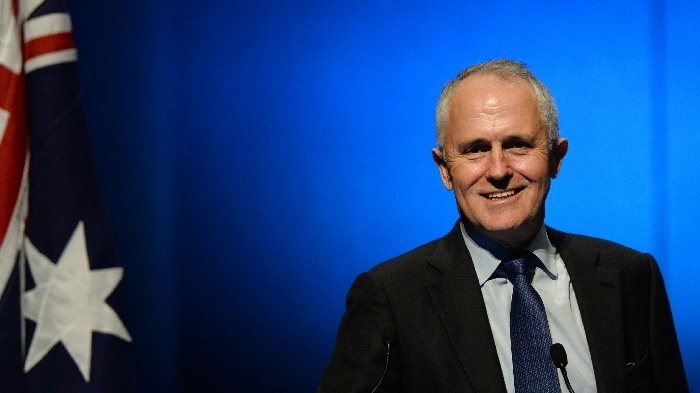 The current Communications Minister and only man in the Liberals with the qualities worthy of prime ministership, Malcolm Turnbull! He was the leader before Abbott back when the Libs were in opposition, then he pissed them off because he dared to be prepared to negotiate with Labor over the Carbon Tax (oh the horror that is negotiation) and he was subsequently thrown out in a leadership spill by Tony Abbott. Figure this can go here - some absolutely gorgeous Pokemon art. It really is beautiful, right? Reminds me of some illustrations from Peter Rabbit or something like that. That is how Pokemon could look if Nintendo wanted to evolve the series into something truly beautiful. I could see this type of traditional style of art being used in a big Wii U game. Don't expect any skillful play from me though, I'm low on the ladder and I'm using a really rubbish rain team I threw together because I was sick of trying to make a balanced ou team that works so I figured I'd go for a team that, while not balanced, I at least know how to play. Alas that knowledge all but fled me this battle and I made several critical mistakes. Despite that it was a fun match to play. Like I said I made some big mistakes, in bullet point form hre are the ones I've noticed. *Why was that a mistake you ask? Because I feared a Gengar switch, when I shouldn't have. No matter what happened Earthquake was the best play there. If he'd stayed in Magnazone would have died, if he switched (which he did) I would have done a nice 65 percent to azumarill, and if he'd gone to Gengar I'd have outsped it and killed with Waterfall. That last is also the reason why predicting a switch to any of his levitating pokemon was plain stupid of me. He wouldn't go to either Lando or Zard because if I chose waterfall they'd both straight up die, and Gengar wouldn't survive a Waterfall the next turn. Put very simply supposing he had predicted an Earthquake and gone to Gengar he'd have then doubled in to Azumarill, basically resulting in the exact same thing that happened, only I'd have maximized my opportunity to damage him rather than minimized it. Lastly, Swampert lived by 2 hp at the end, in case anyone was curious how close it was to dying to that sludge wave. I don't know why they went Sludge Wave as despite it being a stab it had a statistically lower chance of killing than it did killing, the roll they got was basically .2 of a percent from the maximum Sludge Wave can to do megapert. The only thing I can think of as to why they went Sludge Wave is that their Gengar was either sub-disable (and didn't therefore have Shadow Ball and also had Focus Miss for coverage), or they didn't think its coverage moves would have sufficient power. Or they misclicked, but with the mind games they pulled I don't think that was it. We all misclick from time to time but I think a simple overestimation of their Gengar was the reason. Also if anybody wonders why I didn't mention the fact that Swampert could have swept his last four pokemon and why I didn't just go straight to it after reapplying rain, because at the health Swampert was it it wouldn't live an Aqua Jet from Azumarill in the rain. Now if I'd realized what would have happened because I didn't go to it I might have played a little differently, but I stand by that particular choice. Had this yesterday, to be honest it was one of the more thrilling battles in recent times. I'll admit early on I was tempted to forfit, because the amount of parahax completely destroyed my early game and my Wobbuffet (plus helped my opponent get three layers of spikes on the field which destroyed my switching options) and I've been having some seriously awful luck at the moment so I was tempted to just quit and write the match off as another battle ruined by hax. My team runs on weather induced by switching my Politoed in, I need that to be able to get rain up and use Swampert and Ludicolo to batter the opposing team to pieces. With three layers of spikes on the ground I lost 25 percent health for every switch, combined with any damage from an attack. This meant I couldn't switch Politoed in on anything besides a ko, which wasn't an option given I'd already lost one pokemon and had another crippled. On top of that their Hippowdon meant I couldn't just send in Toed, let it get koed, and then tried to sweep with the seven turns of rain I would have, because as long as it was alive it could just wipe out the rain and with it my two match winners. Instead I stuck with it, and managed to pull things back in to genuine contention. Then around the twenty turn mark I started to feel like maybe, just maybe, I could possibly scrape a win if I could somehow deal with the Hippowdon that made getting rain up impossible. Then I managed to get my own set of spikes set and Stealth Rock to boot, suddenly I was not the only person losing 25 percent health for every switch and the match became fairly even. Anyway, yeah, really fun battle overall, made all the more fun by the rotten start. Also I really love Porygon2, fantastic Pokemon. Is this where we talk about Pokken? I'm not quite sure. Regardless, the game has a Japanese release date (a fortnight's time) and two new characters. Weavile looks boss, especially its iridescent Shadow Claw. It's probably still not for me, but eh. Wasn't Blaziken originally shown off? Still no sign of the flaming chicken. No grass types (among others) yet either.